What is Healthcare Value Analysis? Are You Ready to Sign Up to Become a Certified Value Analysis Advisor Today? Introductory Price - $279 - The low cost of this program includes all of your training, certification testing, certificate and lapel pin. 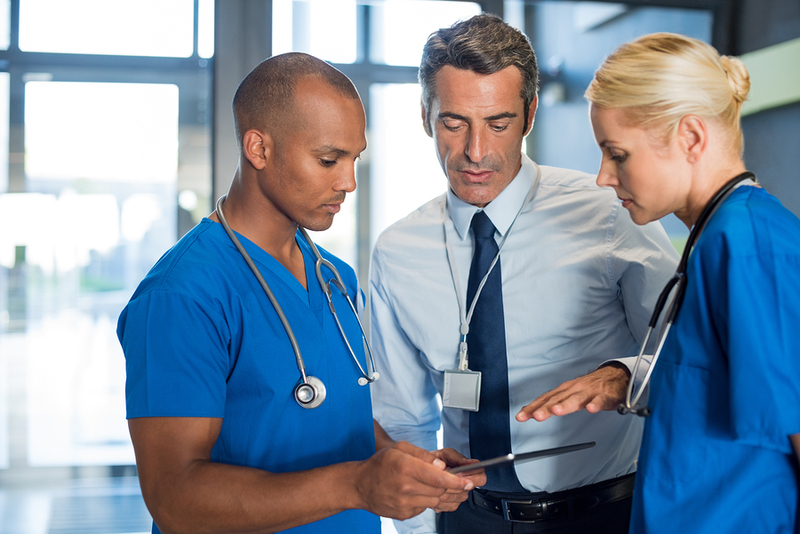 “Hospital’s buying teams DO NOT have the time and the resources to fully uncover every aspect of a vendor’s product line to bring about savings opportunities. It is the sales representative’s job to utilize a value analysis based system to bring about the next generation of Value Analysis solutions! This program is a program to help sales and non-provider professionals to understand and better engage in the value analysis process that is going on in hospitals and health systems throughout the country. It is not a system to show you how to shortcut or bypass the value analysis committees/teams in a hospital or health system. WHAT IS THE TRAINING BASED ON? The training is based on the classic tenants of value analysis which is based on the functional approach to viewing product, services and technology. This system aligns value with function first which if function is met then quality goals will be met as well. Price will then be a secondary thought after function has been made. Value analysis duties are complex, time consuming and outright hard for value analysis professionals to perform. If you could start to offer value analysis based solutions to their cost and quality goals that they are trying to accomplish, you can create a Win/Win relationship with your customers. Because of the nature of contracting in the healthcare supply chain world, often problems are solved by switching away from the manufacturer who's products are causing the problem. This could be the cost being too high or the product failing to meet customer requirements. How do you prevent your customers from canceling your contract and finding an alternative vendor? You must take on the value analysis approach to assist your customers to find the solution to their problems within your product line. Plus, there is a major cost to change in time and resources in an organization so you will be saving your value analysis customers a lot by being able to understand value analysis and offer value based product and service solutions. You can take the test up to 8 times without having to purchase a new CVAA program. HOW SOON WILL WE GET OUR PIN AFTER WE PASS THE CERTIFICATION? 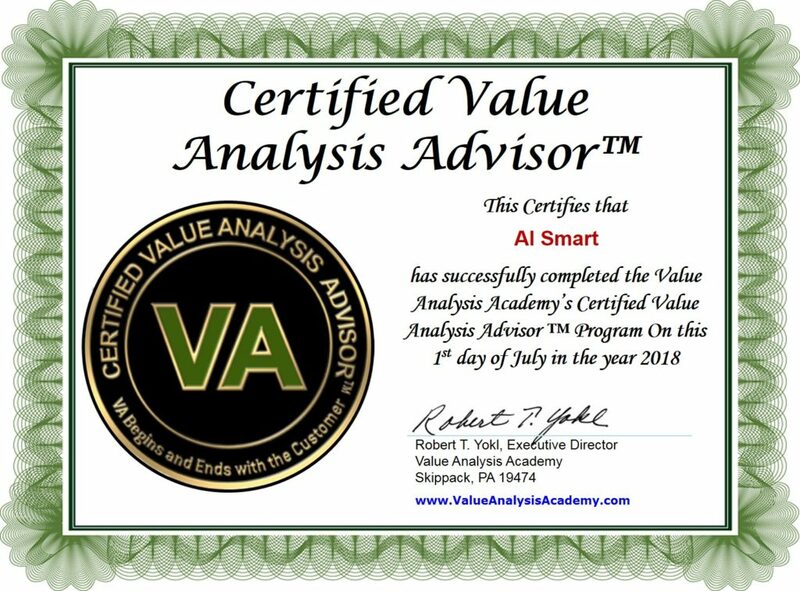 Pins are sent out every Monday after tests are completed, if your test was completed and you passed the prior week, you will receive your Certified Value Analysis Advisor ™ Pin sometime that next week. These are mailed by U.S. Postal Service. WHAT SORT OF SUPPORT COULD WE EXPECT AFTER CERTIFICATION? The VA Academy is here to assist you with all of your value analysis related challenges by email and phone. Just give us a call or an email and we will assist you. We will also have additional training programs to further your skills and knowledge beyond your certification program but these will be at additional fees.